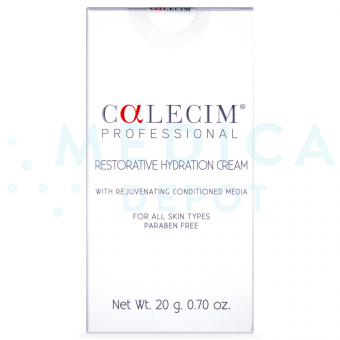 What is CALECIM® Professional Restorative Hydration Cream? 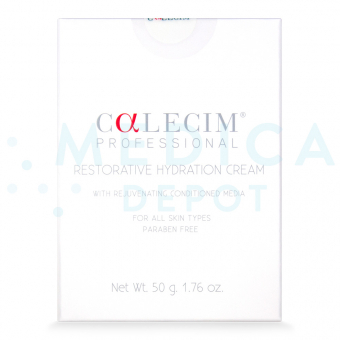 CALECIM® Professional Restorative Hydration Cream is a light moisturizing cream that is manufactured by Cellresearch Corporation Pte. Ltd. It is indicated to be used with other corrective skincare products, so that it will help to improve the elasticity and radiance of skin. This cream contains CALECIM Rejuvenating Conditioned Media, a patented and potent protein-rich mixture that is unique to only CALECIM Professional skincare products. The proprietary component is extracted and purified from umbilical cord lining, which is rich in nourishing stem cells. The key ingredients present in this patented component are albumin, collagen, hyaluronic acid, fibronectin, and glycoprotein or peptide. Other vital ingredients include aloe vera, tocopherol, and glyceryl stearate. These ingredients penetrate deep into the skin to improve the appearance of aging signs like dehydration, discoloration, wrinkles, and loss of contour. Patients may be able to observe early skin improvements about 2 to 4 weeks after continuous twice-daily cream usage, while optimal results will only be noticeable after 90 days. Patients of various skin types like sensitive, dry, normal, and combination can use this cosmeceutical product safely. This versatile cream can also be incorporated into patients’ usual skincare regimen. If you are a licensed medical practitioner, you can purchase this hydrating cream from www.MedicaDepot.com. Kindly note that only registered clients can purchase this cream; medical practitioners who are yet to be our online member may create an account online. 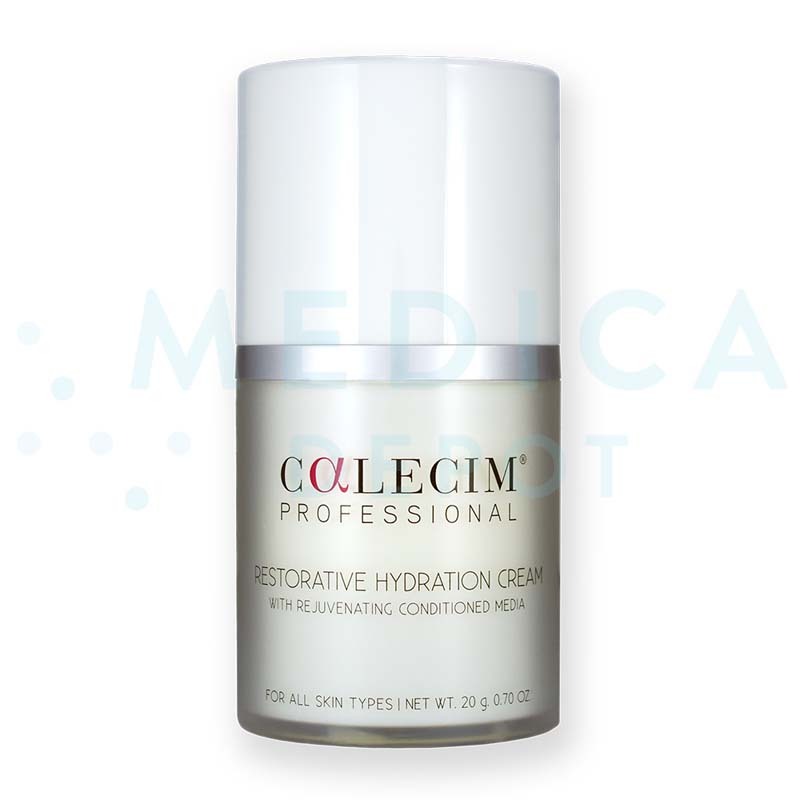 Once your account had been verified, you can start buying CALECIM Professional Restorative Hydration Cream and other skincare products. Your Medica Depot membership entitles you to receive various benefits such as free shipping on orders above $250 and wholesale prices. 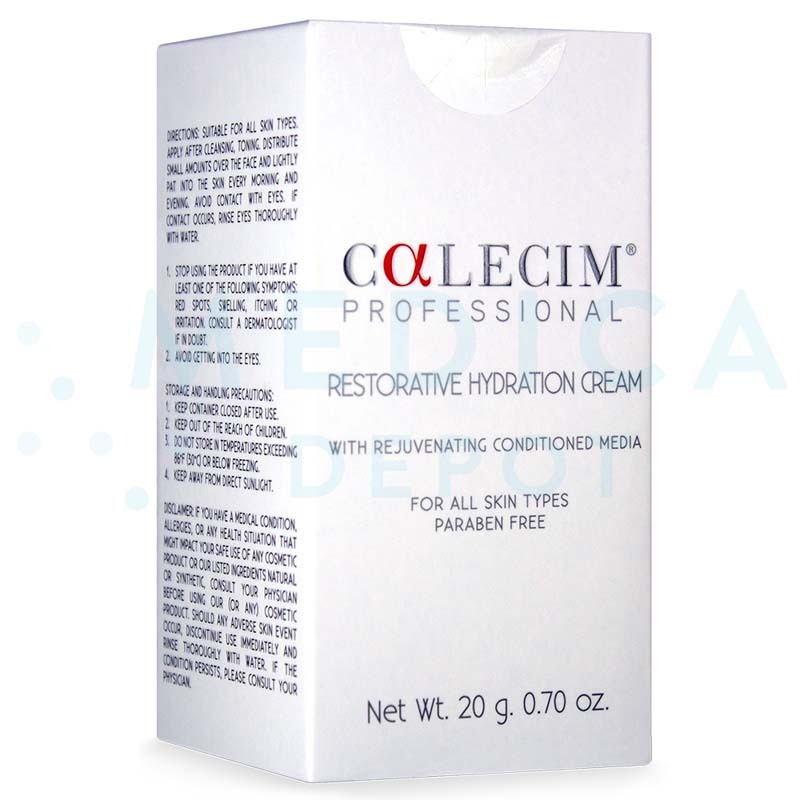 Each box of CALECIM Professional Restorative Hydration Cream comes with a 20g or 50g jar. 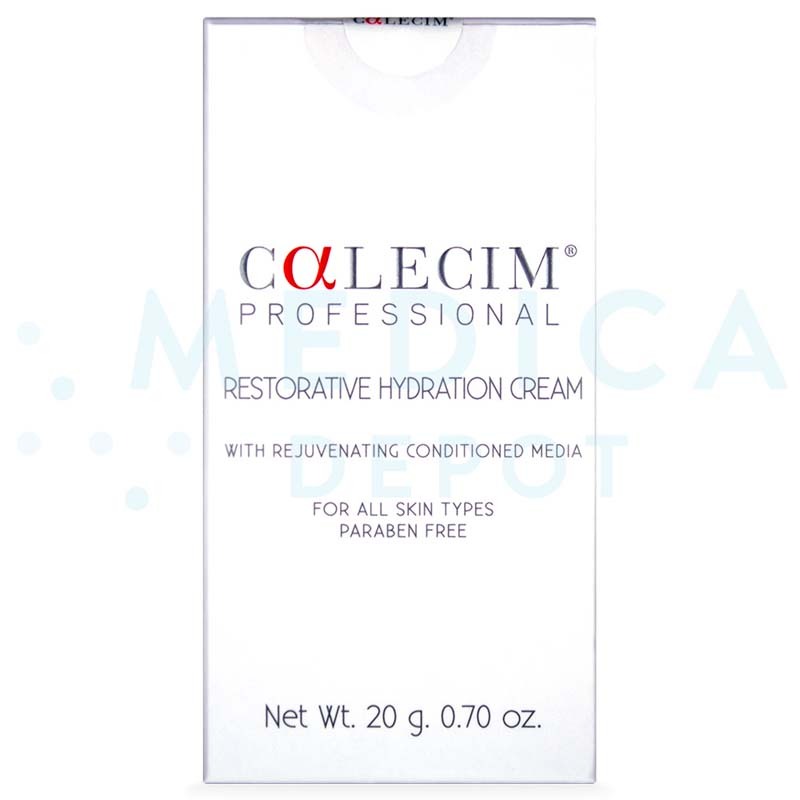 CALECIM Professional Restorative Hydration Cream is distinguished from other skincare products due to the integration of CALECIM Rejuvenating Conditioned Media. This patented component helps to soften the appearance of aging signs by reinforcing the underlying skin structure. 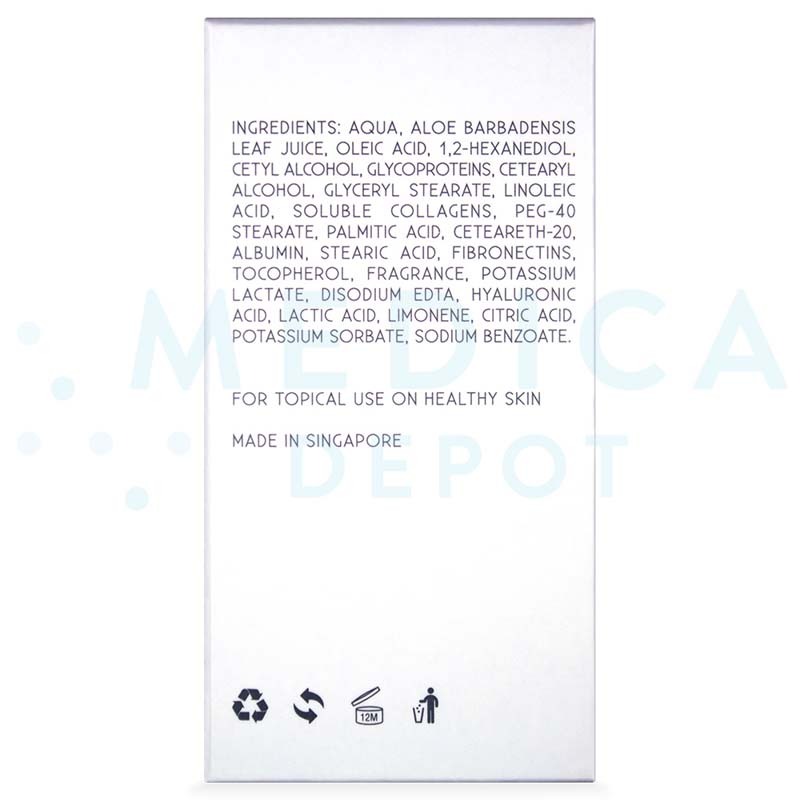 Other ingredients like aloe vera and glyceryl stearate replenish moisture, so that skin remains well-hydrated. Newly rejuvenated skin cells are protected from free radical damage by the antioxidant tocopherol. This antioxidant also prevents trans-epidermal water loss (TEWL). Most importantly, this cream is processed using Youth Messaging Technology, a unique cream delivery system that promotes the production of important skin glycoproteins like hyaluronic acid, and the epidermal cellular turnover rate. Common dermal imperfections like dehydration, uneven skin tone, sagginess, fine lines, deep-set wrinkles, loss of facial volume, and rough skin texture happen due to the uncontrollable aging process. 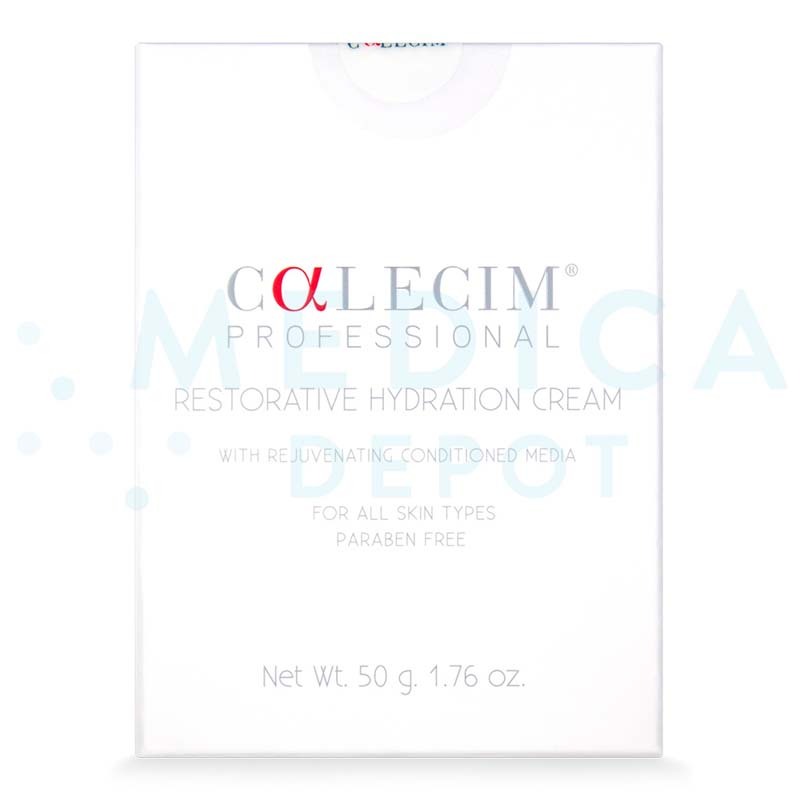 CALECIM Professional Restorative Hydration Cream is rich in growth factors and proteins derived ethically from mammalian umbilical cord lining. The ingredients will also help to hydrate the skin. With continuous usage, skin becomes plumper and more elastic, while unattractive dermal imperfections are repaired. The list above is not exhaustive. Refer to the package insert for a complete list of ingredients. How to administer this product? Before applying this skin rejuvenating cream, your patients should cleanse and tone their face and neck thoroughly. Then, apply a pearl sized amount of the cream all over clean face and neck. Massage thoroughly to ensure absorption of the cream. Advise your patients to use this cream every day, in the morning and at night. For optimal skin improvements, patients can use this lightweight moisturizing cream with other CALECIM professional skincare products. Patients with signs of dermal aging such as uneven skin tone, dehydration, fine lines, wrinkles, loss of facial volume, lack of defining facial contours, and rough skin texture should use this product. Patients can also use this product after undergoing any cosmetic treatments, so that skin recovery process is quickened. This light textured moisturizing cream can be applied on the face and neck, especially when the skin in these regions are affected by signs of aging. The ingredients in this skin nourishing cream help to reset the skin’s renewal cycle back to 28 days. So, patients should be able to notice skin improvements in as early as 2 to 4 weeks, while peak results of this cream are noticeable about 90 days. Due to the unique formulation of this cream, patients of varying skin types lie sensitive, dry, normal, and combination can use this skincare product. This product will help your patients’ skin condition improve greatly due to the integration of various skin rejuvenating proteins. While there are not many side effects that have been reported, patients may still experience skin blemishes as the skin renewal cycle is restored. Once the cycle is reset, epidermal cellular turnover rate increases, and old and dead cells are shed away, which can result in breakouts.